In the summer I told you about the cucamelons I grow and how much I love them. This was was my second year growing them. Every year I choose something brand new to grow....and the weirder the better! This year my weird plant was Japanese white egg eggplant. I chose to grow Japanese white egg eggplant (Solanum melongena) this year because their so darn cute! Plus, I really wanted to try a different eggplant to see if I could get the kids to eat it. They basically look like chicken eggs growing on a plant, they even hang by one end like a mini egg tree. Basically an eggplant that looks like an egg! They are great to cook with and have a mild, more subtle flavor then regular eggplant. These are great in stir frys and baba ganoush. I started my seeds indoors two months before my projected last frost date. Use a seed heating pad as eggplant seeds require fairly warm soil to germinate. I didn't write down the exact date the seedlings appeared, but it was around 2 weeks. Transplant to garden after soil has warmed up. 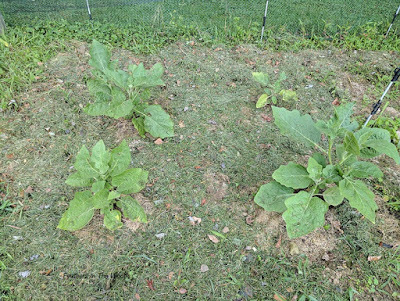 Space plants about 2 feet apart. I put a ton of compost in the hole when I planted them since I had read they like a lot of organic matter. Plant in well drained soil in full sun. Japanese white egg eggplant likes to be watered quite often. I fertilized every two weeks, otherwise a fairly low maintenance vegetable. 65 days to maturity. The eggplant has a slight glossy look when ready to harvest. These gave me heavy yields all season long. The more I picked, the more they seem to produce! 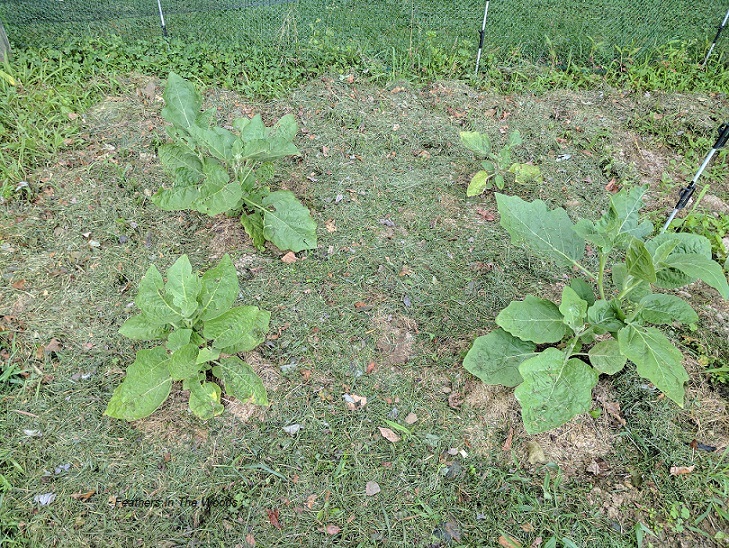 These white eggplants did very well even in the hottest weeks of summer. Mulching heavily with straw, dried grass or dried leaves in extreme heat does seem to help. Japanese white egg eggplant are fairly disease and pest resistant, though the deer loved the foliage. I did have a pest that was putting little holes in the leaves. Since flea beetles are a typical problem for eggplant and it was only the eggplant I had the problem on, I'm blaming them. I used some of my marigold pest spray and it really cut down on the problem. This is a bushy plant that grows to about 3 feet tall. These eggplant can be grown in the garden or on the patio in containers. To harvest, cut eggplant from the plant with about an inch of stem attached. These eggplants generally don't pull free by hand. I use garden shears. To save seeds, allow eggplants to over ripen on vine. The skin will start to yellow and get a bit tougher. Remove seeds, they should be dark and hard. Clean eggplant seeds and allow them to dry thoroughly before storing. Store in paper seed envelopes. This was a fun vegetable to grow and even though they still didn't love it, I did manage to get the kids to eat Japanese white egg eggplant a few times!